Edmonton's "Little Italy" is both a physical place and a state of mind. The heart of the community comprises the few square blocks of inner-city Edmonton roughly between 107 Avenue to 118 Avenue and between 93rd Street and 95th Street. 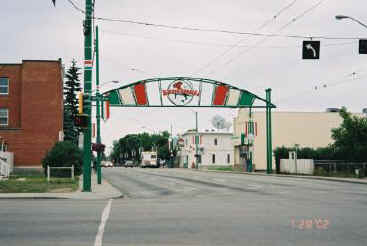 As an ethnic neighbourhood, it came into being with the post-World War II wave of immigration, which saw the Italian population of Edmonton grow from several thousand in the early 1950s to likely 10,000 to 15,000 by the late 1970s. These figures differ from those in the Canadian census but, until 1996, the census did not allow respondents to report on country of origin and the statistics, therefore, did not capture second and third generation Italian-Canadians.